My Boyfriend and I have been together for a number of years (think the last count it was 7 years). My BF is the romantic one on V Day, as for me I just can not stand the cheap and nasty gifts you see in the shops. Keeping this in mind, I love to seek out trinkets that are handmade and my favourite site for British handmade crafts is folksy.com. If you are ever looking for a unique gift this is the place to look first. Here are some Valentine's Day gifts that caught my attention. Artwork by Angie (Etsy Shop & Website link) - I have fallen in love with this seller, check out her shop as everything is beautiful. I have actually placed an order myself for another one of her framed prints. 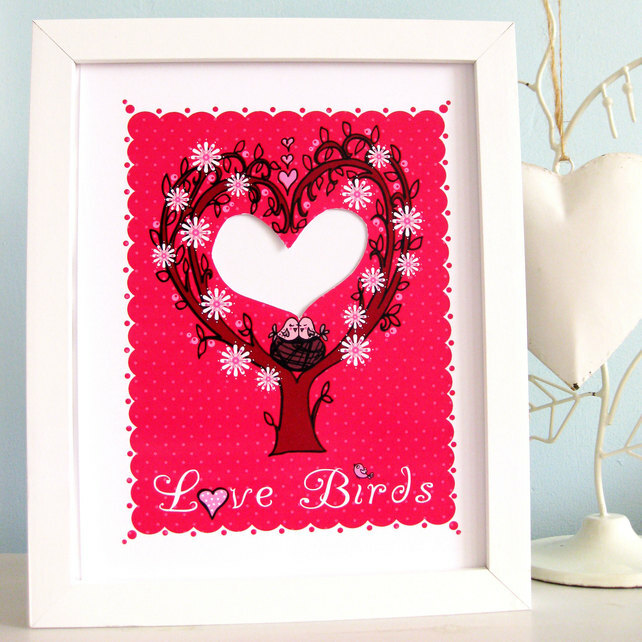 The 'Love Birds' framed pictured above is stylist and you can place a picture of the happy couple in the heart. The heart broach (above) is from Buttercup Boutique (Folksy link). 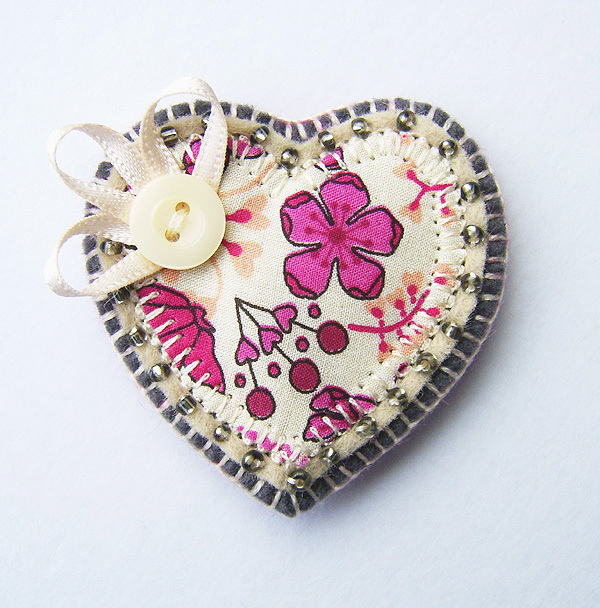 This seller has some beautifully designed broaches and keyrings. 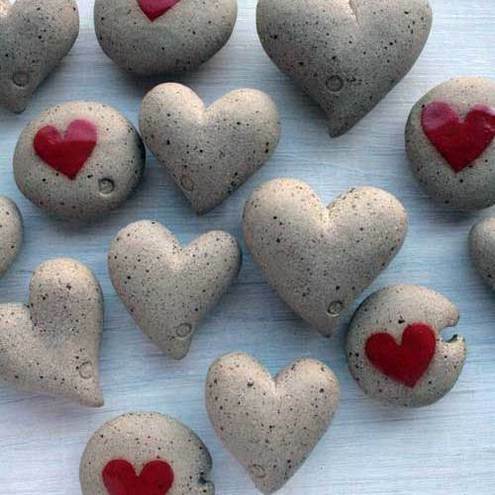 If you like ceramics then I would recommend taking a look at Jo Lucksted Ceramics (Folksy link). I adore these Valentine pebbles. I also love glass gifts and this "Key to your Heart" keyring from Prettyful caught my eye. How about sending your loved one Pink Iced Love Heart Cookies? 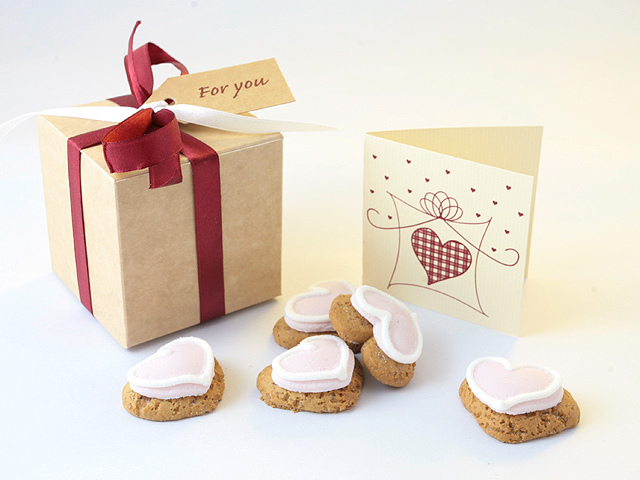 I often order from Message Muffins and they currently have Valentine's Day gifts. If you are not familiar with the site you can send a cookie or muffin in the post. Out of all the companies I know of that offer this service, Message Muffins has never let me down and their prices are affordable. Some of the Organic Muffins are Wheat, Gluten and Dairy free. Finally, since this is a beauty blog I should at least mention a skincare gift. Bodhi have a Love for Her & Love for Him gift set. For those not familiar with Bodhi, it is a luxury natural skincare brand free from animal ingredients, palm oil, parabens, sls, petrochemicals, artificial colours and fragrances. I would love to hear your thoughts on my gift ideas, do you have any other suggestions for me? Disclaimer: This is not a sponsored post and I am not affiliated to anyone featured. Thanks I am please you liked my gift selection. Bodhi products are gorgeous, I have been testing them out recently, the fragrances remind me of Moulton Brown but minus the toxic ingredients. I LOVE the love birds photo frame!